At the heart of the ongoing Promotional Positions Classification Review is the need to recognise the huge changes and burgeoning complexity the roles of school leaders have undergone in the quarter of a century since they were last evaluated, and to ensure that they are fairly remunerated for the value their work provides. 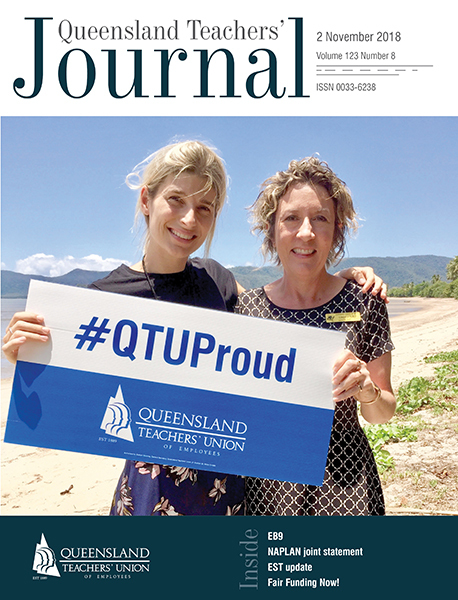 Here more QTU principal members explain what they do, the stresses involved and what they hope to see emerge from the PPCR. The world is moving faster now than when I first became a principal 15 years ago. Technology and immediate response requirements make the role far busier than it used to be. Fifteen years ago, if someone made a complaint, it would be mailed to the department. Now it is emailed, Facebooked, texted or shared online, all of which can create a political and/or media frenzy. The age of entitlement means that many parents, staff and students have unrealistic expectations of what their entitlements are. It also appears that all departmental emergencies, media queries or ministerial enquiries become the responsibility of the principal. It is not unusual for principals to receive emails reminding them that compliance with certain “in the media” issues must be addressed urgently, along with a reminder that some principals have received demotions and even been terminated for those errors. These things and others add to the complexity of the role as it is today. And stress and exhaustion can be a problem if one is not able to manage the additional workload and the additional emotional impact of being a school principal. The severity of staff and student trauma that a principal is required to manage can take its toll on your wellbeing, and continual vexatious and/or frivolous complaints that require continual/ongoing responses are time consuming and very frustrating. That’s why I’d like to see the PPCR deliver a recognition of the work that is required of a school principal, taking into account the demographics of the school and the context that the principal is working in. As principal of a large school, I am the CEO of that operation – with just under 700 students, 98 staff, families and a complex community to manage. As principal of a school, however, I do not have the capacity/autonomy/flexibility to lead of a comparable company CEO. The remuneration of principals must reflect the work and accountability placed on the position. I am proud to be a special school principal and enjoy being able to make a difference to the students and staff at my school. Unfortunately, the complex behaviours and medical needs of our students often require my attendance at a moment’s notice. It is essential that I support and lead staff when these unpredictable situations arise. Students starting on new medications, suffering from complex seizures or experiencing mental health and behavioural difficulties can often require additional support. Principalship requires me to be contactable by staff, state government security and the region outside of school hours. Schools are dynamic. As principal, I accept and manage many of the responsibilities for improving our society by addressing, through education, many of the problems that emerge in everyday life. Compounding this scenario, the media seems to create a negative view of our skills as professionals. Parental expectations for the holistic development of the child and opportunities to communicate with staff are becoming more and more difficult to meet. Although positive, changes to disability policy also contribute to the pressure and responsibility of this role. Exhaustion often sets in after an enormous week of cumulative incidents when I have needed to maintain the school’s stability during a number of critical events. I find that I am often supporting student and staff wellbeing and needing to respond to issues which can become emotionally draining. Managing an upset and/or angry parent who becomes personally abusive and/or threatening is always very stressful. My deputy and I have agreed some non-negotiables, which include exercise and sharing a great sense of humour. I have far-ranging responsibilities which include financial management, human resources, student, staff and site safety. When I compare my management responsibilities to professionals in other fields, I recognise that the wage I earn sits far below many other managers with similar responsibilities. It is imperative the PPCR should ensure principals are renumerated according to the diverse and extremely responsible work which is the basis of our role.